Carol Channing is possibly one of the most beloved performers of our time. With three Tony Awards and one Oscar nominations, Channing has left a mark on the stage and on the screen. 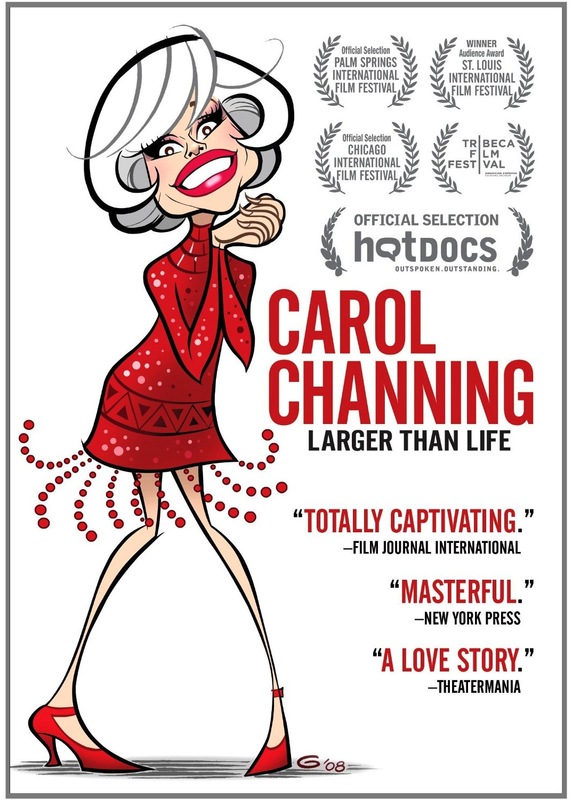 The documentary Carol Channing: Larger Than Life captures Channing’s career and talent. Dori Berinstein’s biography is not an in-depth character study. Instead it captures the essence of Carol Channing; the stuff that makes her Carol. Berinstein makes use of old archival footage, television clips, and interviews with friends, co-stars, and admirers of Carol’s to tell her story. Known mostly for her role as Dolly in the 1964 Broadway hit Hello, Dolly and the film Thoroughly Modern Millie (1967), the raspy voiced Carol is often viewed as an unlikely star. The personality she was when she hit the stage in Hello, Dolly is the same personality she embodies now at the age of ninety-one. She carried that personality, which some say is who she is, not just a character, everywhere she went—stage, film, television, and on the street. Channing’s first exposure to the stage was delivering the Christian Monitor, the magazine of the Christian Scientist, in theaters in San Francisco for her parents. She describes walking into the theater at the age of seven for the first time; she says she felt like she was standing on holy ground. At an early age, she found her place in this world. She left that day determined to fulfill the calling she felt that day. And that she did. For Carol, standing on holy ground was connected to who she saw herself as; her vocation; her calling. We don’t hear people talk about their careers in such a way very often. Unlike Moses standing barefoot before a burning bush, Carol was not hesitant about her calling. She knew that being on the stage was the most comfortable thing for her to be, and she did everything from that point on to gain experiences to fulfill her calling. Carol talks fondly of her father and her teachers supporting her in various school activities. A surprising amount of the film was spent on her relationship with Harry Kullijan, where the film becomes a love story. Harry and Carol were junior high sweethearts who met seven decades later, after Carol’s failed marriages and the death of Harry’s wife. You can see why they were meant for each other. They coo over each other as they recall stories and memories like love-struck teenagers. In a way the film becomes homage to their romance and friendship. Kullijan would pass away before the film was released. As the stories unfold about Carol’s life, it is clear that she is a compassionate and gracious soul. “The heart Carol shows on stage is the heart she shows in real life,” Barbara Walters observes in the film. And that is who Carol is. A gracious soul who stays positive on and off the stage, with a positive outlook and barely a negative word to say about a person. A model for all of us to live by. The DVD includes 15 bonus scenes from the cutting room floor that didn’t make it into the film. If you are a Channing film, you are going to want to see these. In one of these, Carol talks briefly about praying before Hello, Dolly started on opening night. Overall, the film is enjoyable mainly because it does what it needs to, it lets Carol Channing be Carol Channing.